I don’t use any pesticides and grow everything in my garden organically. Most of us urban organic garden folk who have apples and pears share our fruit with pests. We know that our fruit will have worms or be a bit bruised and bumpy. We do what we can to deter the pests. I use compost tea to feed my trees. Diseased leaves are raked and taken away as yard waste to be composted at our nearby mulch and landscaping facility. The tree fruit season comes about the same time as the flickers start, once again, visiting the suet feeder. And when the yellow finches start feeding on the drying seeds of my Russian sage plants. I love this time of year. Fall starts creeping in like fingers of low fog rolling into the nooks and crannies of the Oregon Coast Range. It is a treat for the senses. Beyond these autumn reflections, it’s a time when I am searching for all ways to put up fruit. I dry the most bruised pears. Dried pears are like candy; so sweet. Wash the fruit. You can cut them right onto the drying trays so you don’t need to treat with lemon juice or citrus powder. Cut down the middle of the pear and if it is healthy you can slice thin pear-shaped slices down the whole fruit. No need to peel or core. Lay the slices on the dryer racks. 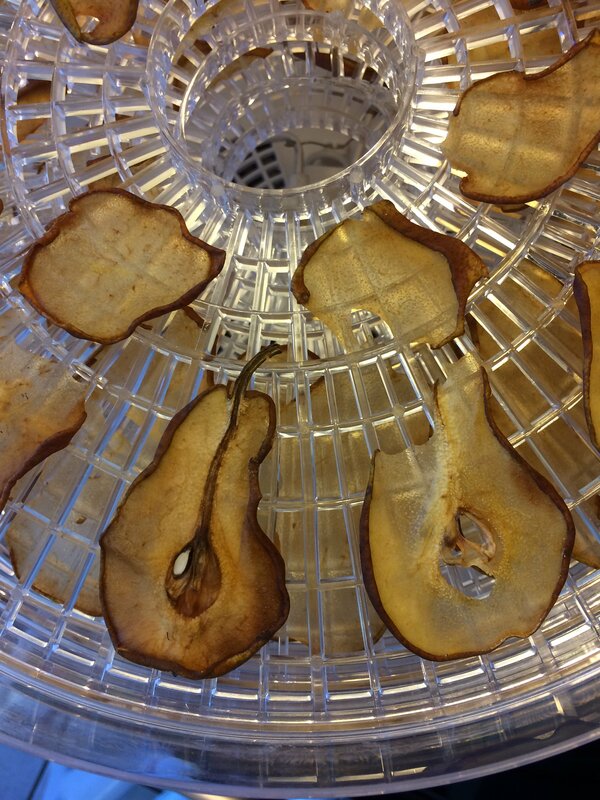 If you have a beat up pear cut around the nasty parts and slice thinly and add to drying rack. I dry them all-day or overnight. You know they are done when most of the moisture is gone and they are chewy when eaten (see photo). I then put them into Ziploc bags and date them. They last a long time! 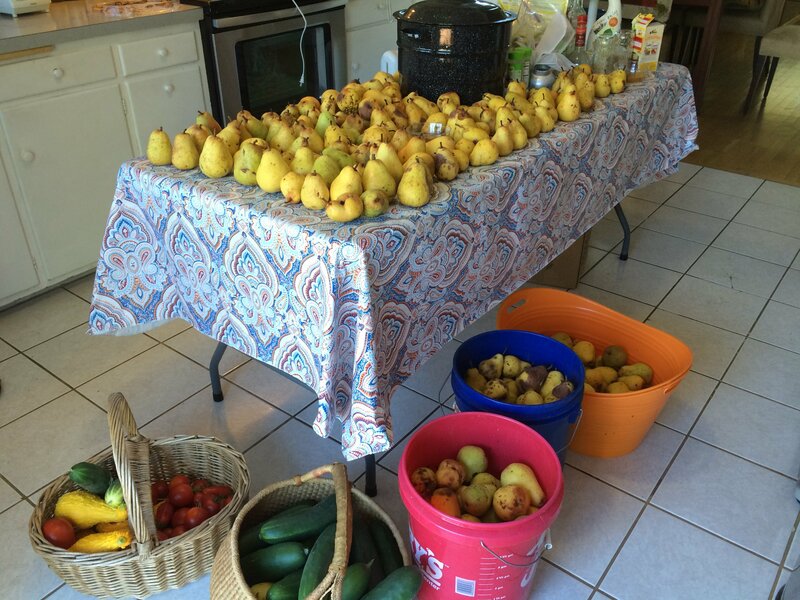 Fruit preservation experts, I am NOT one, say that a year is a good storage estimate. I’ve eaten dried pears and apples beyond that year date, if there are any left. Adding cinnamon, anise, liqueurs or other creative additives to a pear or apple syrup base opens up the flavor possibilities. This syrup, once canned, is not thick like maple syrup but can be thickened with a little cornstarch, post canning, if desired. 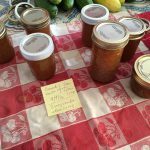 You can use it as a flavorful syrup over pancakes or waffles, as a simple syrup added to your own fanciful cocktail creations, basted on pork chops or ham, or any other number of uses; great for gift-giving as well. Cut nasty bits out but you don’t need to peal or core. Rinse the fruit as you go to remove grit, mushy areas or other nasty bits. Rinse fruit as you go to remove grit. Once you have the amount of fruit you want – I had about eight quarts – you can go a couple of ways. Option A: Add ½ to 1 cup of water for each quart of fruit (4 cups), bring fruit and water to a boil then simmer covered for 10 minutes. Stir and mash the fruit; simmer for 5 more minutes. Then pour the mix in batches into jelly bag and strain. Option B: put the cut up fruit through a high-powered, electric juicer and strain through a jelly bag. With this option you will have more pulp. I bag up the pulp and freeze it for smoothies or to replace applesauce in recipes. Once you have your pear or apple juice, bring to a boil in a heavy bottomed pan. I cooked it to about 210 degrees. Don’t let it get above 218 degrees or it will get to the jelly point. Watch for foaming at first. You can turn down the heat slightly or add a tablespoon or two of butter to the pear juice to bring down the foaming. This step can take an hour or more depending on how thick you want your syrup.Once your juice is heating up, get your boiling water canner ready and add your jars to the canner leaving 1 to 2 inches of water above the jars. Bring to a boil. This way you have your jars ready when your syrup is ready to add to the hot jars. At the same time, put your lids and rings in a medium pan with water and bring to a simmer, then turn down and keep hot. Once your juice has cooked down and looks thicker, like a simple syrup consistency, add your sweetener. 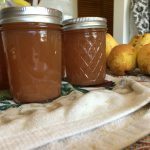 You can experiment with sweeteners here, taking a small amount of your pear syrup aside and tasting it with your favorite sweeter. You can use white sugar, natural cane sugar, Splenda, agave syrup or others. Just taste a small amount before you add it to the full pot. I added about 2 ½ to 4 cups of white sugar. I don’t add as much sugar as some recipes call for. You can add cinnamon sticks, whole anise or whole vanilla bean at this point. If you want to add loose spices tie them in cheesecloth and add them. Cook it down some more. Again, don’t let it get above 218 degrees or it will get to the jelly point. Once your juice gets to the consistency you want you can add liquid flavorings such as vanilla liqueur. For example, I added ½ cup of Licor 43 or Cuarenta Y Tres, a Spanish citrus and vanilla blend of 43 ingredients. I call it boozy vanilla pear syrup. 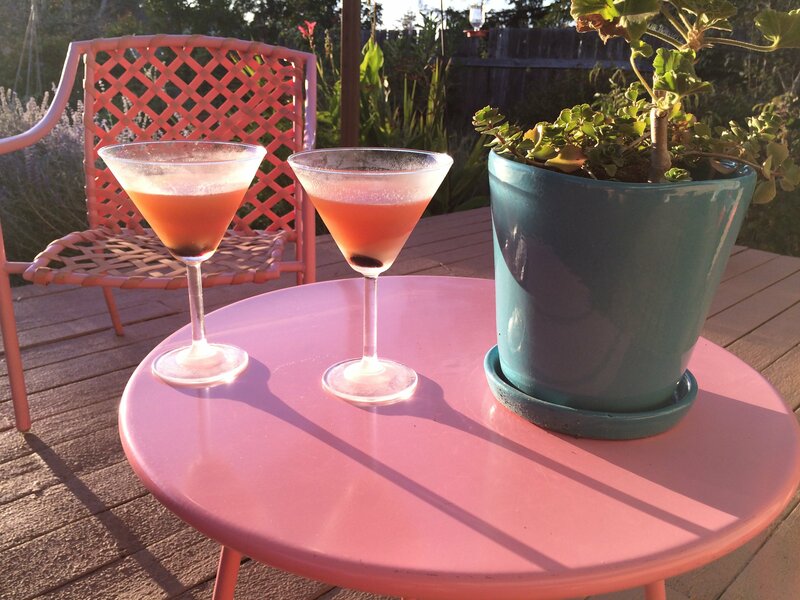 Sipping a vanilla pear Manhattan with your favorite bourbon is a nice way to watch the sun go down. Simmer another few minutes, stirring, to let flavors mingle. Turn the heat to low and let your juice sit while you remove your jars from the canner and set them on a towel for filling. Turn up the boiling water canner to high and bring back to a boil. Use a canning rack to put inside the canning pot so jars don’t touch the bottom. This avoids jars getting so hot they break. Fill your jars leaving a ¼ inch head space. Wipe jars before placing lids and finger tightening rings. Once all of your jars are filled (I had a mix of nine small jars some pints and half pints) you can place them in the rack and lower them carefully into the boiling water. Boil for 10 minutes. Remove jars and set back on towel. You should start to hear the lids pop as the seals are formed. Let them cool. Label and store for a year. Voilà! Enjoy your dried fruit and syrups all through the winter.